You’ve heard it before – personalization is key when interacting with your customers. Without it, they feel like you aren’t there for them. athleteReg wants to make the participant-event relationship more efficient and more personal. 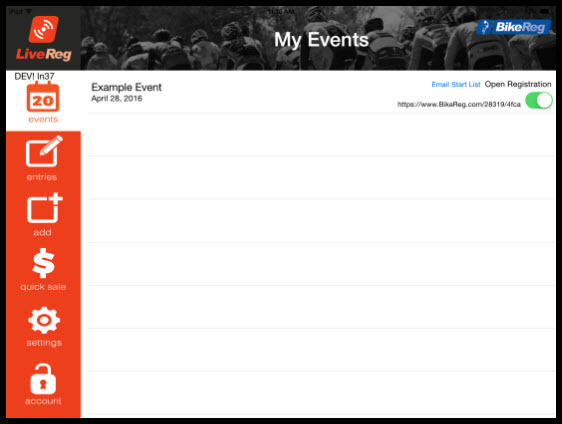 Introducing the participant check-in feature, part of LiveReg, our Day-Of Registration App for iPads. 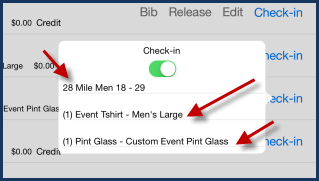 No more spreadsheets and lists to shuffle – with a quick search and tap you can check in participants while simultaneously seeing what merchandise (Event Shirts, Mugs, Pint Glasses, etc.) they have ordered. When start lists are generated or sent through the LiveReg app to the timer, you’ll have an up to date list of starters sorted by those who have checked-in (highlighted in green). No more guessing at who’s on course. Since the app is connected to the athleteReg database in real-time, all of this valuable data is also available through the event director side at any time. Consolidating your data, eliminating guesswork, and reducing workload is pretty much what you’ve asked for, right? Post-event, you will now have a clear picture of who registers for the events, what merchandise they purchased, and the timeline of when they check in on event day. 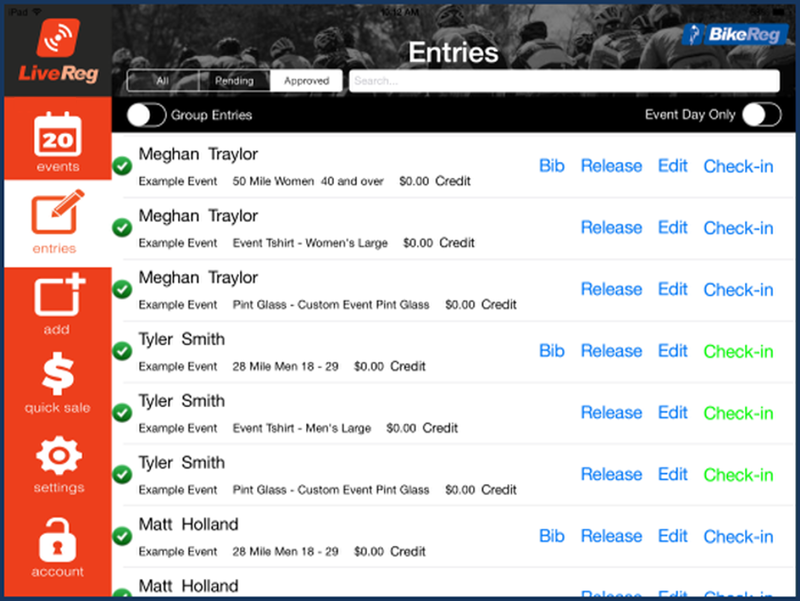 Fewer mistakes, increased efficiency for both staff and participants, and more complete participant data to use as a reference for future events. Everybody wins! To use this feature, log into the LiveReg app and go to “My Events”. Find the event you are looking into participants for, and click on “Entries”. You can also click on the “Event Day Only” toggle to show all the participants who are registered for your event that day. Beneath each name will be the merchandise they have purchased. From here, you can check them in and ensure all details are in order. Catch up with the rest of our blog to learn more about LiveReg and all of our other products and services that help you get to know your customers and grow your events. athleteReg is more than just online registration. Through sport-specific sites (BikeReg, RunReg, SkiReg, and TriReg) as well as integrated fundraising tools and on-site registration and check-in apps, we provide innovative tools and expert advice. LiveReg is the Day-Of registration management and payment portal for all athleteReg sites, letting you integrate your event day registration with your existing athleteReg event to keep all your data and funds in one place. The app can be used as a basic point-of-sale system, a data entry tool, a check-in app, or a full-featured paperless registration system. athleteReg was created and founded in 1999. Today, we offer one of the most robust systems on the market.